"Royal Leamington Spa" redirects here. For other uses, see Leamington (disambiguation). Royal Leamington Spa, commonly known as Leamington Spa or Leamington /ˈlɛmɪŋtən/ ( listen), is a spa town in Warwickshire, England. Originally a small village called Leamington Priors, it grew into a spa town in the 18th century following the popularisation of its water which was reputed to have medicinal qualities. In the 19th century, the town experienced one of the most rapid expansions in England. It is named after the River Leam, which flows through the town. In the 2011 census Leamington had a population of 55,733. 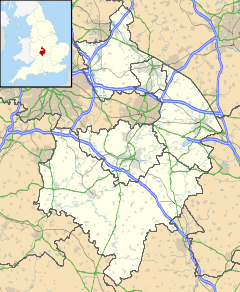 Leamington is contiguous with the neighbouring towns of Warwick and Whitnash, which together form a continuous urban area, in 2011 the urban area had a population of 95,172. Formerly known as Leamington Priors, Leamington began to develop as a town at the start of the 19th century. It was first mentioned in the Domesday Book of 1086 as Lamintone. For 400 years, the settlement was under the control of Kenilworth Priory, from which the older suffix derived. Its name came from Anglo-Saxon Leman-tūn or Lemen-tūn = "farm on the River Leam". The spa waters had been known in Roman times, and the rediscovery in 1784 by William Abbotts and Benjamin Satchwell led to their commercialisation. Six of the seven wells were drilled for; only the original spring at the site of the Aylesford Well, adjacent to the Parish Church, occurred naturally. The old village of Leamington Priors was on the southern bank of the River Leam, and early development was based around this. During the 1820s and 1830s, builders began concentrating the town's expansion on the land north of the river, resulting in the Georgian centre of New Town with the Leam flowing between the two. In 1840 the Victoria Bridge was opened, connecting the old and new towns, replacing an old, narrow, and inconvenient bridge. In 1767 Parliament passed an Act, proposed by Edward Willes, a local landowner, for dividing and enclosing the open and common land on the south and west of the River Leam. Following a survey of the area by John Tomlinson in 1768, the land was estimated to be 990 acres (4.0 km2) and was subsequently divided, and new public roads were laid out. After the division on the south of the river most of the land east of the village was owned by the Willes family and to the west by Matthew Wise. To the north of the river most of the land was owned by the Willes family, the Earl of Warwick, and Bertie Greatheed. The main landholders of the village and adjacent land were the Earl of Aylesford, and a number of smaller landowners. In the following decades some of the land was sold. The growth of Leamington was rapid; at the time of the first national census in 1801, Leamington had a population of just 315, by 1851 this had grown to 15,724, and by 1901, the population had grown to nearly 27,000. In 1814, the Royal Pump Rooms and Baths were opened close to the River Leam. This grand structure attracted many visitors, expecting cures by bathing in pools of salty spa water. It also included the world's first gravity fed piped hot water system in modern times, which was designed and installed by the engineer William Murdoch. Leamington became a popular spa resort attracting the wealthy and famous, and construction began of numerous Georgian townhouses to accommodate visitors, and a town hall was built in 1830. In 1832 the town's main hospital, Warneford Hospital, opened, named after philanthropist Samuel Wilson Warneford. At first a semi-private affair it was taken over by the National Health Service after the Second World War, before succumbing to budget cuts and closing in 1993. With the spread of the town's popularity, and the granting of a 'Royal' prefix in 1838 by Queen Victoria, 'Leamington Priors' was renamed 'Royal Leamington Spa'. Queen Victoria had visited the town as a Princess in 1830 and as Queen in 1858. A statue of Queen Victoria was almost destroyed by a German bomb during the Second World War, and was moved one inch on its plinth by the blast. The statue was not returned to its original position, and the incident is recorded on a plaque on its plinth. The function of the Royal Pump Rooms changed several times over the following years. While retaining its assembly rooms and medical facilities, around 1863 it was extended to include a Turkish bath and swimming pool, in 1875 the Royal Pump Room Gardens were opened to the public, and in 1890 a further swimming pool was added. The economy of Leamington decreased towards the end of the 19th century following the decline in popularity of spa towns, and it became a popular place of residence for retired people and for members of the middle class who relocated from Coventry and Birmingham, and wealthy residents led to the development of Leamington as a popular place for shopping. In 1997, the owners of the building, the district council, closed the facility for redevelopment, reopening it in 1999 as a culture centre. It now contains Leamington Spa Art Gallery & Museum, a library, a tourist information centre, refurbished assembly rooms and a cafe. Spa water can still be sampled outside the building. Leamington is closely associated with the founding of lawn tennis. The first tennis club in the world was formed in 1872 by Major Henry Gem and Augurio Pereira who had started playing tennis in the garden of Pereira. It was located just behind the former Manor House Hotel and the modern rules of lawn tennis were drawn up in 1874 in Leamington Tennis Club. During the Second World War, Leamington was home to the Free Czechoslovak Army; a memorial in the Jephson Gardens commemorates the bravery of Czechoslovak parachutists from Warwickshire. Leamington Spa is a town and civil parish in the Warwick District, an administrative division of the county of Warwickshire. Since 2002 the parish has been represented at the lowest tier of local government by its Town Council. Between 1875 and 1974 Leamington was a municipal borough. As part of the 1974 local government reform it was merged with Warwick, Kenilworth and Whitnash, and surrounding rural areas into the Warwick District, which has its offices in Leamington. Leamington is part of the parliamentary constituency of Warwick and Leamington. From the 1997 general election until the 2010 general election the constituency was represented in parliament by James Plaskitt of the Labour Party; until then this had been a Conservative safe seat, counting former British prime minister Anthony Eden among its MPs. The seat became highly marginal at the 2005 general election, where James Plaskitt won with a majority of just 266 votes. In the 2010 general election the seat returned to the Conservative Party, with Chris White winning the seat by 3,513 votes. White remained the MP until the 2017 general election, when the seat was won by Matt Western of the Labour Party. Leamington is divided by the River Leam running east to west, which is susceptible to flooding in extreme weather, with especially heavy floods in 1998 and 2007. The town has several parks and gardens, including the Jephson Gardens, close to the Royal Pump Rooms and next to the River Leam. These were seriously damaged in the floods of 1998, but have been restored and improved with funding from the National Lottery. The other side of the River Leam, on Priory Terrace features the "Elephant Walk" 19th-century slipway down to the river located near the suspension bridge in Jephson Gardens. It was specifically constructed so that circus elephants in winter quarters in Leamington could be watered. Other parks are the Mill Gardens on the opposite bank of the river to Jephson Gardens, Victoria Park, the Royal Pump Room Gardens, The Dell and Newbold Comyn which includes the nature reserves Welches Meadow and Leam Valley. The road running through the town centre is the Parade (formerly Lillington Lane until 1860). The shopping street contains high street chains and a covered shopping centre named The Royal Priors. Amongst the Anglican churches in Leamington is the Gothic All Saints' Church. There is a Catholic church, two United Reformed churches (one being in Lillington), a small mosque and a Hindu temple. In 2009, the Sikh community built the Gurdwara Sahib Leamington and Warwick in Warwick which also serves Leamington. There are also Christadelphian and Jehovah's Witnesses meeting halls in the town. In August 2010, a Warwickshire Justice Centre was opened in Newbold Terrace, Leamington Spa. As well as a police station, the complex houses the Magistrates' Court, Crown Court, County Court, and other agencies such as the Probation Service and Victim Support. It was officially opened by Queen Elizabeth II on 4 March 2011. The town has enveloped the older village of Lillington. Other suburbs include Milverton, Campion Hills, and Sydenham to the southeast. The town of Whitnash is contiguous with the town to the south and is often considered as a suburb. The data is for wards Brunswick, Milverton, Manor, Crown, Clarendon and Willes. The popularity of the town's waters in the 19th century led to the town's initial growth, making tourism Leamington's primary industry in the 19th century. In the town centre there are a variety of shops from high street chains to independent retailers, plus an indoor shopping centre, The Royal Priors. The out of town retail park is called the Leamington Shopping Park (formerly The Shires Retail Park). Tourism was initially driven by the spring waters. The arrival of the Warwick and Napton Canal (later amalgamated into the Grand Union Canal) officially opened in 1799 as the primary means of cargo transport and led to growth in other industries until rail gradually took over in the mid 19th century, The canal supplied coal to the gasworks on Tachbrook Road, providing gas to light the town from 1835. Pig iron, coke and limestone were delivered by canal, allowing a number of foundries to be established in Leamington, specialising in cast iron stoves. Today the Eagle Foundry, dating from at least 1851, continues to manufacture Rangemaster Aga stoves. The Imperial Foundry, dating from around 1925, was subsequently taken over by Ford, casting engine blocks until its closure in 2008. The prominent car parts manufacturer Automotive Products based in the south of the town grew from a small garage to occupy a large site. Throughout the 20th century, while tourism took a downturn, Automotive Products expanded and built a factory in the South of the town in 1928 that is still operative in 2009, although on a much smaller scale. Karobes Limited, with its headquarters in Queensway, was one of Britain's major suppliers of accessories for cars between World War II and the 1970s. Commercial parks for service providers and light industry and offices are primarily located to the south of the town: Althorpe Street Industrial Estate, Queensway Trading Estate, Shires Gate Trading Estate and Sydenham Industrial Estate. In June 2014, Detroit Electric announced that they would be building their SP.01 all-electric roadster in Leamington Spa. Leamington Spa and the surrounding area, known as Silicon Spa, is a significant global centre for the video game industry, with a higher than average proportion of digital media companies involved in games development, digital design and publishing, and over a thousand employed directly in game development. Companies based in or around the town include Third Kind Games, Caperfly, Widgit Software, DNA Interactive, Fish in a Bottle, FreeStyleGames, Full Fat, Kwalee, Pixel Toys, Playground Games, Red Chain Games, Stickman Studios, Supersonic Software and Midoki. Codemasters are based in the countryside outside Leamington and were the initial impetus behind the cluster, providing many of the staff for the companies in Leamington. In 2013, Sega's mobile platform studio Hardlight Studio set up in Leamington, and Exient opened a satellite studio. Former companies were Blitz Games Studios, Bigbig Studios and Titus Software UK Limited. Local hospitals include the Royal Leamington Spa Rehabilitation Hospital and the Warwickshire Nuffield Hospital. There are a number of schools either located within Leamington, or which include Leamington in their priority (catchment) area. Those within Leamington include the state secondary schools of North Leamington School, Campion School, Trinity Catholic School, and the independent schools of Arnold Lodge School, a co-educational school for pupils aged 3 to 18, and Kingsley School, a school for girls. Myton School in Warwick, although located just outside Leamington, includes parts of Leamington as being within its priority area. As well as these schools, Leamington children can attend Stratford-upon-Avon Grammar School for Girls, a state run selective school, Warwick School, an independent school for boys, the King's High School for Girls, Warwick's twin school and Princethorpe College, a mixed independent school in the nearby village of Princethorpe. Leamington is the location of the first of Warwickshire College's six sites, and additionally another site is located just outside the town. The closest higher education institutions are the prestigious University of Warwick, in southwestern Coventry, and Coventry University. The town is particularly popular with Warwick University students seeking housing and entertainment. Leamington is also home to two national educational charities – The Smallpeice Trust and The Arkwright Scholarships Trust. They specialise in making young people aware of how STEM fields studied in school can lead to fulfilling and exciting careers in science and engineering sectors of industry. Leamington Spa Art Gallery & Museum is located in the Royal Pump Rooms, on the Parade. It provides exhibitions in the visual arts and about the history of the town, supported by workshops, talks and other events. There are several local community centres. Since 1978, the annual free festival and celebration of alternative culture called the Peace Festival has been held in the Pump Room Gardens. Live music is provided by local bands in a variety of venues. In December 2005 the band Nizlopi from Leamington, reached Number 1 in the UK Singles Chart with The JCB Song. The Woodbine Street Recording Studios has been used by several well-known music acts such as local band The Shapes, whose single "Batman in the Launderette" charted first in 1979, Paul Weller, Ocean Colour Scene, Felt and The Specials. Classical music concerts are organised throughout the year in the Leamington and Warwick area, including the International String Quartet series at the Royal Pump Rooms. The Assembly, is a 1,000 capacity music venue attracting national and international artists, and was awarded 'Live Music Venue of the Year' at the 2010 Music Week Awards. and the Leamington Spa Competitive Festival for Music Dance and Drama is staged annually. There is a brass band called the Royal Spa Brass. In May 2016, 92 of the local musicians participated in A great day in Leamington Spa, a reconstruction of the 1958 photograph A Great Day in Harlem. Two theatres are located in Leamington: the Spa Centre and the amateur The Loft, with outdoor summer productions in Jephson Gardens. Leamington also has two cinemas: the Spa Centre and a multiplex. There are a number of sports clubs and leisure facilities in Leamington Spa, including a Real Tennis court, the football club Leamington F.C., a disc golf course Quarry Park, a leisure centre including swimming pool Newbold Comyn Leisure Centre, rugby grounds Leamington Rugby Union Football Club, Leamington Rugby Club – Youth Section and Old Leamingtonians Rugby Football Club, Leamington Cricket, Leamington Hockey Club, Leamington Cycling club, Leamington Athletics club, Spa Striders Running Club, Royal Leamington Spa Canoe Club, Leamington Chess Club, formed in 1851, and municipal tennis courts. The Royal Leamington Spa Bowling Club in Victoria Park hosts the annual National Lawn Bowls Championships. Leamington has been featured in a number of television series, including the 1990s BBC situation comedy Keeping Up Appearances – filmed in and around the area. Notable episodes included one with Walton Hall which had footage of the actual town in them, including the River Leam being featured as a fishing and boating spot. Other series include the drama Dangerfield and comedy detective series Mayo. In September 2010 scenes for a re-make of the series Upstairs, Downstairs were shot on Clarendon Square and in The Jephson Gardens. In Jonathan Strange and Mr. Norrell, the Duke of Devonshire owns a house here, and offers it to Mr. Norrell as a place to set up a magic school upon the advice of the Earl of Liverpool. The ancient town of Warwick lies adjoined directly to the west of Leamington, on the opposite bank of the river Avon, and with no natural border to the south-west. Whitnash is a smaller town contiguous with Leamington directly to the south. Cubbington is adjoined to the north-east. Just outside the town lie the villages of Old Milverton to the north and Radford Semele 2.5 miles (4 km) to the east. Stratford-upon-Avon, famous as William Shakespeare's birthplace and the home of the Royal Shakespeare Company, lies south-west from Leamington Spa along the Warwick Road (A439). Leamington Spa experiences the oceanic climate which covers most of the United Kingdom. Rail: Leamington Spa railway station is served by the Chiltern Main Line, which links London Marylebone to Birmingham Snow Hill and onwards to Kidderminster. Fast train services on this route are operated by Chiltern Railways. Chiltern Railways also run trains via Warwick to Stratford-upon-Avon. West Midlands Trains operate local services to Birmingham and onwards to Worcester Shrub Hill. A line connecting Leamington Spa to Coventry used by CrossCountry provides services to Banbury, Oxford, Reading, and Bournemouth to the south, and to Coventry, Birmingham (New Street), Manchester, Newcastle and Edinburgh to the north. Bus and coach: Regular bus services to Kenilworth, the University of Warwick and Coventry are operated by Stagecoach in Warwickshire and National Express Coventry. Services to Warwick, Banbury, Stratford-upon-Avon and Rugby are operated by Stagecoach in Warwickshire and by other independent companies. Coaches to locations nationally and internationally are available. Air: Leamington's nearest international airport is Birmingham Airport. A general aviation airport and former tourist charter hub, is the nearby Coventry Airport from which currently (2011) no scheduled passenger services are in operation. Waterways: The Grand Union Canal is used for recreation. This crosses the River Avon between Leamington and Warwick, and then passes the town to the south, parallel to the River Leam to the north. The rivers are not used for transport, but there are proposals to render them navigable. Cycleways: there are national and local cycleways into and around Leamington. Trams: Between 1881 and 1930 Leamington & Warwick Tramways & Omnibus Company operated between the two towns. Other famous people to live or have lived in Leamington include the inventor of the jet engine Frank Whittle (1907-1996) who lived in Leamington as a child, the television presenter Anne Diamond, and the comedian Russell Howard. Sir Bernard Spilsbury was also born here. ^ a b "ROYAL LEAMINGTON SPA in Warwickshire (West Midlands) Built-up Area Subdivision". Citypopulation.de. Archived from the original on 11 March 2018. Retrieved 10 March 2018. ^ "The Penny Magazine 1833–1848". Extracted and digitised by The Society for the Diffusion of Useful Knowledge. Archived from the original on 27 September 2011. Retrieved 9 August 2009. ^ a b c "Leamington Spa Courier". The Courier. Johnston Press Digital Publishing. Archived from the original on 28 September 2009. Retrieved 9 August 2009. ^ "UNITED KINGDOM: Urban Areas in England". City Population. Archived from the original on 8 April 2018. Retrieved 8 April 2018. ^ a b c d Allen, Geoff (2000). Warwickshire Towns & Villages. ISBN 978-1-85058-642-5. ^ J. E. B. Gover, A. Mawer, and F. M. Stenton, in collaboration with F. T. S. Houghton, The place-names of Warwickshire (EPNS 13), Cambridge 1936. ^ a b c "The borough of Leamington Spa". British History Online. Retrieved 17 June 2018. ^ a b c d e Cave, Lyndon Fraser (1988). Royal Leamington Spa: Its History and Development. Phillimore & Co Ltd. p. 44. ISBN 978-0-85033-520-0. ^ "Royal Pump Rooms website". Warwickdc.gov.uk. 20 September 2010. Archived from the original on 2 January 2014. Retrieved 15 January 2014. ^ "Royal Leamington Spa Town Council". www.leamingtonspatowncouncil.gov.uk. Archived from the original on 12 March 2007. ^ "Jumbo flood warning issued". BBC News. 17 October 2003. Archived from the original on 18 October 2003. Retrieved 30 May 2011. ^ "Films cancelled after town floods". BBC News. 24 July 2007. Retrieved 30 May 2011. ^ "Judgement day as Leamington goes for gold again – Leamington Spa Today – Back to Home Page". Leamingtoncourier.co.uk. Retrieved 27 May 2009. ^ "Nature reserves". Warwick District Council. Archived from the original on 1 September 2012. Retrieved 20 June 2012. ^ "Plaque at Lansdowne Crescent". Archived from the original on 8 March 2012. Retrieved 30 May 2011. ^ Wright Hassall Law (5 February 2010). "How The Leamington Gurdwara Was Built". PRLog.org. Archived from the original on 2 September 2012. Retrieved 17 June 2012. ^ "Warwickshire Justice Centre, Leamington Spa". Criminal Justice Board. Archived from the original on 4 March 2011. Retrieved 4 April 2011. ^ "Queen officially opens RSC theatre and justice centre". BBC News. 4 March 2011. Archived from the original on 18 January 2016. Retrieved 4 April 2011. ^ "Leamington Shopping Park". Leamington Shopping Park. Archived from the original on 16 January 2014. Retrieved 15 January 2014. ^ Brad Anderson (30 June 2014). "Detroit Electric Confirms U.K Production for SP:01". www.gtspirit.com. GTspirit. Archived from the original on 14 July 2014. Retrieved 1 July 2014. ^ a b c d Lee, Aaron (12 September 2013). "Region Focus: Midlands, UK | Games industry press releases | Develop". Develop-online.net. Archived from the original on 19 January 2014. Retrieved 15 January 2014. ^ Guthrie, Jonathan (27 December 2009). "Silicon Spa spots opportunity to get serious". FT.com. Archived from the original on 24 September 2015. Retrieved 15 January 2014. ^ "Silicon Spa is UK's 3rd Largest Gaming Cluster – Invest Warwickshire". Invest.warwickshire.gov.uk. 12 August 2013. Archived from the original on 17 October 2013. Retrieved 15 January 2014. ^ "Leamington Spa – the Capital of Digital Creativity". www.campbellmarsh.com. 18 March 2014. Archived from the original on 22 March 2014. ^ Still Booming Archived 1 May 2015 at the Wayback Machine, The Leamington Observer., 5 July 2012. ^ "Official Homepage". Red Chain Games. Archived from the original on 1 January 2014. Retrieved 15 January 2014. ^ "Buccaneer: The Pursuit of Infamy GamesIndustry International". Gamesindustry.biz. 23 October 2009. Archived from the original on 19 October 2013. Retrieved 15 January 2014. ^ "Official Homepage". Midoki. Archived from the original on 31 March 2014. Retrieved 31 March 2014. ^ Games Still Booming, The Birmingham Post, 22 March 2007. ^ "Hardlight Studio". Hardlight Studio. 13 August 2013. Archived from the original on 18 January 2014. Retrieved 15 January 2014. ^ "Exient". Exient. 24 January 2013. Archived from the original on 8 February 2014. Retrieved 15 January 2014. ^ "How Leamington Rehab Hospital's friends make the road to recovery smoother for patients". Leamington Courier. 15 August 2012. Retrieved 13 September 2018. ^ "Nuffield Hospital Warwick". NHS Choices. Retrieved 7 December 2018. ^ "Secondary school priority areas: Central area" (PDF). Warwickshire County Council. Archived from the original (PDF) on 13 September 2011. ^ "Leamington Peace Festival". Peacefestival.org.uk. Archived from the original on 16 May 2014. Retrieved 15 January 2014. ^ "Nizlopi's 'JCB Song' Goes Straight In At Number 1". Gigwise. 18 December 2005. Archived from the original on 18 September 2012. Retrieved 27 May 2009. ^ "Woodbine Street Recording Studio – Home". Woodbinestreet.com. 20 February 2009. Archived from the original on 5 May 2009. Retrieved 27 May 2009. ^ "The Assembly "about venue" page". leamingtonassembly.com. Archived from the original on 31 August 2009. Retrieved 27 September 2009. ^ "Music Week Awards winners 2010 page". Archived from the original on 23 June 2011. ^ "Royal Leamington Spa Bowling Club". RLSBC. Archived from the original on 26 August 2017. ^ "National Events Portal". Bowls England. Archived from the original on 26 August 2017. ^ "Leamington Spa historic weather averages in the United Kingdom". Intellicast. Archived from the original on 1 March 2012. Retrieved 28 March 2009. ^ "Tribute to boxing's 'Leamington Licker'". BBC News. Retrieved 31 March 2019. ^ a b "30 celebrities you probably didn't know were from Warwickshire". Coventry Telegraph. Retrieved 31 March 2019. ^ "Sir Frank Whittle's workshop is saved from demolition". BBC News. 9 November 2014. Retrieved 31 March 2019. ^ "oneworldlink.org.uk". oneworldlink.org.uk. Archived from the original on 16 May 2014. Retrieved 15 January 2014. Wikimedia Commons has media related to Royal Leamington Spa.